Asian giant leaf turtles (Heosemys grandis) are also known as giant leaf terrapins, Asian giant wood turtles and giant Asian pond turtles. These large reptiles are listed as vulnerable by the IUCN Red List of Threatened Species due largely to habitat loss and hunting. Heosemys grandis are semi-aquatic -- they require access to water as juveniles but are primarily terrestrial as adults. 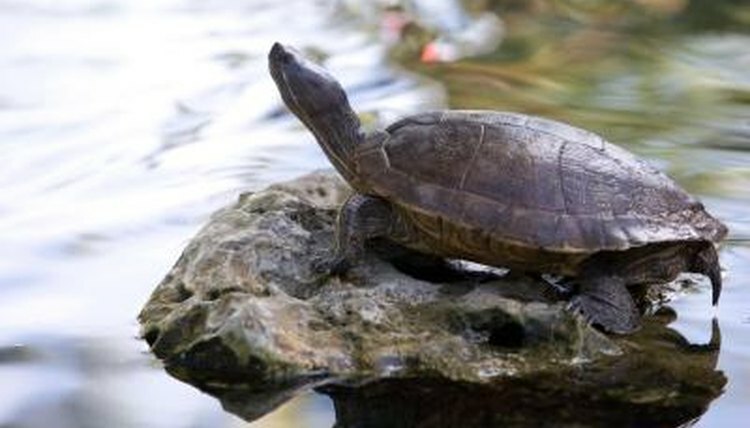 Hatchlings and juvenile Asian giant leaf turtles are round when viewed from above, but become more elongated with age. The carapace of an Asian giant leaf turtle is dark olive to charcoal in color and studded with small spiky protrusions in the rear, while the shell covering the underbelly is yellow. The head and feet are typically a light gray to light brown, and albino Asian giant leaf turtles are not uncommon. Adult Asian giant leaf turtles can reach 17 inches in length. Asian giant leaf turtle young spend 90 percent of their time in the water before moving to land. Once on ground, Asian giant leaf turtles remain near water, mostly to bask. The habitat of adult Asian giant leaf turtles consists of brush and vegetation, and in some cases these turtles will climb low-lying branches of trees. In captivity, Asian giant leaf turtles require access to warm, clean water and a large enclosure -- not a tank -- in which to roam around. Asian giant leaf turtles are very active during the day. Although herbivorous in the wild, Asian giant leaf turtles thrive on omnivorous diets in captivity. In nature, these reptiles indulge in fruits and vegetation, enjoying in particular the stalks, leaves and bulbs of the water hyacinth. Pet Asian giant leaf turtles eat a mixture of fruits such as melons and mangoes, vegetables such as squash, sweet potato and carrots and proteins from pre-prepared turtle mixes, earthworms and even pink baby mice. During feeding times, Asian giant leaf turtles can become aggressive, snapping at fingers and ankles of caretakers. Asian giant leaf turtles should be kept warm and dry; although these turtles are quite hardy, cold and wet weather causes respiratory problems as well as other health issues. Commonly found in ornamental Buddhist monastery gardens, Asian giant leaf turtles are known for having a playful and easily tamed personality, and do well in an environment with plenty of space and access to the outdoors. Asian giant leaf turtles love to explore and can be found checking out low tree branches, sunning at water edges and even burying themselves in mulch. Turtles and Tortoises: Everything About Selection, Care, Nutrition, Breeding, and Behavior; Richard Bartlett et al. Reproductive Trends in Captive Heosemys grandis (Geoemydidae); J. Michael Goode et al. What Does a Tropical Rainforest Turtle Eat?